In this culinary skills contribution by Nick Vaughan-Roberts of Peppercorn of Llandeilo, they explain the importance and techniques of keeping knives sharp – not for murderous intent we hasten to add! Just for er…cooking purposes. A sharp knife is usually safer than a blunt knife. The key to maintaining a knife’s edge is not to lose it in the first place. Letting it go blunt then sharpening it, makes it harder to get the edge back on a neglected knife! A sharp, well honed knife will cut through food easily and is a pleasure to use. A blunt knife can be frustrating and it is potentially more dangerous as more force is needed and it could slip off what you are trying to cut. Most European knives such as Wusthof are ground to an angle of 18-22º whereas Asian knives, such as Global have a finer edge at 10-15º. The different types of knives will require different sharpening processes. European knives need to be sharpened little and often, Asian knives should be sharpened less frequently but more thoroughly. There are many sharpeners and each has its own characteristics. The Diamond Sharpener is coated with up to 2,000,000 industrial diamonds. The abrasive surface allows you to create a new edge quickly and efficiently. To be used in the same way as a steel. Use this item to recover a blade edge. Do not use regularly in place of a honing steel. A Honing steel is coarser and more effective on a duller blade. A steel works by honing, or re-aligning the cutting edge. They are a maintenance tool and are fantastic for keeping a knife sharp but they cannot re-create an edge or rescue a very blunt knife. The Ceramic Sharpener is a very hard material. The surface of this rod is less abrasive than a Diamond or Honing steel. This steel is used maintain an already sharp knife and keep the edge finer for longer. It requires a bit of practice to use a steel, if used incorrectly you can cause more harm than good and you end up with a knife that is actually more blunt! Alternatively, a pull through sharpener is straight forward as it guides the blade at the correct angle. These work like mini steels as they are designed to hone and maintain a sharp edge and yet require less practice and skill than a steel. The mini steels, diamond pads or ceramic wheels are set at the appropriate angle for sharpening either European or Asian blades. 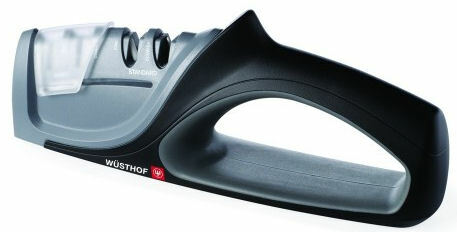 To use these sharpeners simply drag the entire length of the blade through the fixed ‘V’ shaped. Repeat until the knife is honed. A whetstone is the preferred choice of many professionals, especially those with Asian knives, as it can form a new edge on a knife and will also hone and maintain a blade. However, like a steel, it does require a little practice and skill to use a whetstone properly – but if you want superb results it is worth learning how to use one. The coarseness or smoothness of a whetstone is graded by a ‘grit number’. This refers to the size and number of particles that the whetstone is made of. The lower the grit number the coarser the whetstone; the higher, the smoother. The smoothest or sharpest edge is achieved on a higher grit number. The Grit numbers can range from 240 to 8000 and beyond. Click here for a guide on how to use a Whetstone. The blade must be held at the correct angle to the steel. A European blade should be between 18-22º while an Asian blade should be 10-15º. The best way to arrive at this angle would be to start at 90°, half to 45° and then half again to 22° and repeat again for an asian edge. As long at the angle is consistent the knife will sharpen. Be sure to ‘pull’ the entire blade across the steel. 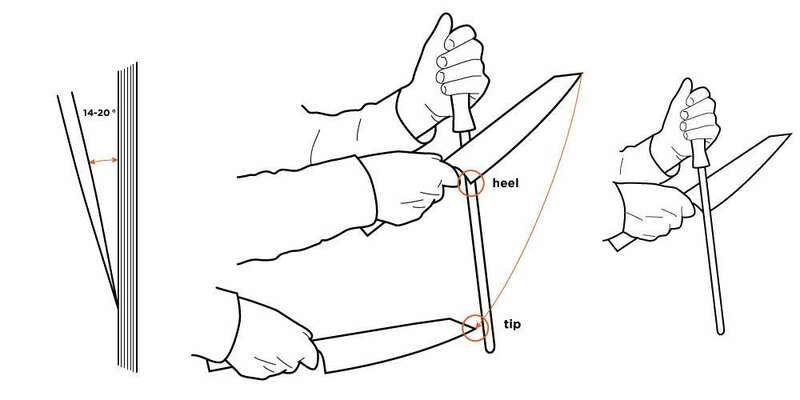 Pull the knife across the steel from heel to tip. Be controlled. Apply even pressure. For the right amount of pressure imagine you are cutting a fine slice off the steel. Do the same number of strokes to both sides of the blade. Submerge the stone in water for about 5 – 10 minutes. Continue to apply water while sharpening. The stone releases small particles during the sharpening process. This powder in combination with water allows for a smooth sharpening process. Place the stone on a slip-resistant base like a towel. Move the blade back and forth at an angle of 18°-22° (European) or 10 – 15° (asian) using gentle pressure. Start at the tip of the blade, continue to move across the edge whilst sliding the knife in a curved action as shown in the video below. Now repeat the same process on the other side of the blade. Finally, turn the stone over and repeat the procedure, this time using the fine grit 1000-3000 of the stone. In order to remove the remaining burr, pull the blade at the correct angle over the stone. Now you will have achieved the best sharpness. Rinse the stone and clean off the grinding residue. Clean your knife with hot water. Please take utmost care when sharpening your knives to prevent injuries.